I wanted to give you a brief update as to how your Virginia chapter division membership dues are being utilized at the state leadership level. During the late fall, VA-AAEM leadership was engaged with the Virginia Hospital and Healthcare Association (VHHA) to help influence guidelines for screening psychiatric patients prior to admittance to state psychiatric facilities. An emphasis on evidence based screening labs and imaging was presented and we look forward to continuing to work on this front to minimize unnecessary delays and or ED evaluations of patients who necessitate state psychiatric care. We have recently returned from our annual legislative trip to Richmond to make sure that our state lawmakers are aware of our members’ concerns. Four VA-AAEM physicians, immediate past president, Dr. Matt Rhames, MD FAAEM, Anita Maybach, MD FAAEM, Todd Parker, MD FAAEM, and myself met with state delegates and senators about upcoming bills that would directly affect our practice. Along with Bob Ramsey, VACEP Executive Director, and Mark Sochor, MD MS, VACEP President, our group of emergency providers actively supported “ED Care Coordination” legislation which seeks to institute proven state wide coordination efforts to reduce low-acuity emergency visits. Specifically, the legislation focuses on the best practices of electronic sharing of patient history across all emergency departments and coordination for complex patients. Both practices have already been shown in Washington state to save health care revenue and improve emergency care. Our group spoke in opposition of prior legislative bills which sought to reduce the number of days of opiate prescribing targeting EM physicians alone. We engaged several lawmakers on this issue and made known our full support of legislation which helps us more comprehensively address the Commonwealth’s opiate crisis. VA-AAEM currently supports legislation which limits opiate prescribing for all physicians to not more than seven days without first checking the Prescription Monitoring Program database, and we, along with the Medical Society of Virginia and VA-ACEP, believe this issue is best left to the Virginia Boards of Medicine and Dentistry to fully implement across all health care providers. Lt. 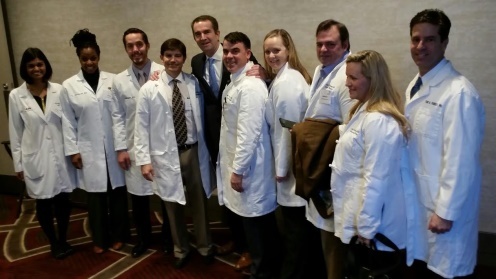 Governor Ralph S. Northam, MD with VA-AAEM President, Dr. Joel Clingenpeel, and VA-ACEP President, Dr. Mark Sochor, and VA-AAEM emergency physician members Drs. Matt Rhames (third from right), Anita Maybach (second from right), and Todd Parker (far right). I’d like to thank our friends at VA-ACEP, Dr. Mark Sochor, Bob Ramsey, and Aimee Siebert for once again helping us to coordinate and enhance our efforts in Richmond. Our chapter divisions have cultivated a great working relationship over the past many years and I value our ability to pool our resources on issues where we agree. Finally, I’d like to congratulate Chesapeake Emergency Physicians (CEP) who recently became the second members of the American Academy of Emergency Medicine Physician Group (AAEM-PG). For those who are unfamiliar, AAEM-PG offers every aspect of business support for democratic EM groups from contract acquisition to maintenance of mature practices. It was exciting to hear Chesapeake Emergency Physicians, Todd Parker, MD FAAEM, and Lewis Siegel, MD FAAEM, describe how the relationship with AAEM-PG is already helping them with both contract payer negotiations and administrative overhead costs. I’d like to thank the members of VA-AAEM for entrusting me to serve you as your President for this term, and I ask that you please reach out to me if I can be of any assistance to you.